Over one hundred years ago, reckless adventurers fought their way down the Yukon River by boat on their voyage to the goldfields. Many struggled through the choppy waters of the White Horse Rapids. Exciting times! Fearless men and women traversed great distances to arrive at their goal- the Klondike. Today it’s much easier to come to us. You probably arrived by cruise ship, plane or RV, but we’re sure you still have the same spirit of adventure in your heart. 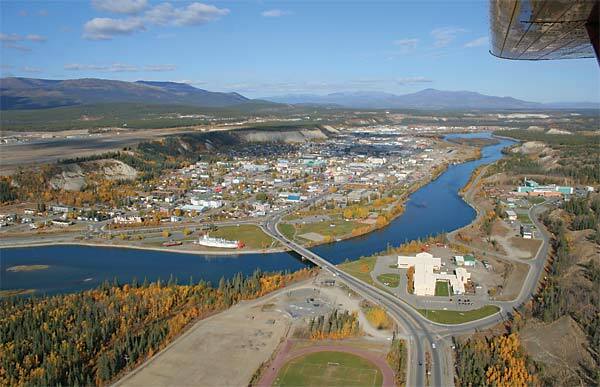 Welcome to Whitehorse, capital of the Yukon, and home to some of the most spectacular scenery in Canada. Named by some the Wilderness City, Whitehorse nestles on the banks of the famous Yukon River surrounded by mountains and clear mountain lakes. Gorgeous scenery and a vibrant city lifestyle, it’s no small wonder over 25,000 people enjoy living here year round. A healthy economy, small town values, a safe environment in which to raise a family, affordable housing, and access to the great outdoors, make Whitehorse one of the best cities in Canada in which to live and work. Whitehorse provides diverse services to all outlying communities. Its economic base includes mining, transportation services, tourism, and government services. Served daily by major airlines, visitors easily connect to Whitehorse from any city in the world. For those adventure seekers wishing to enjoy the spectacular scenery on route, there are plenty of interesting ways to get here. However you arrived, we’re glad you came, and we hope you experience a taste of our unique northern lifestyle. While you’re here, stop by to see us, sign our guest book, and receive a free Whitehorse pin compliments of the City of Whitehorse.